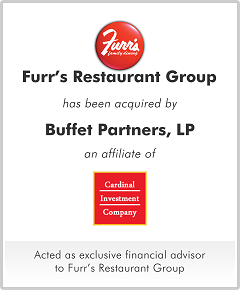 Furr's Restaurant Group, Inc. operates a chain of 55 family-style cafeteria restaurants and a food processing facility in the Southwestern United States, generating revenue of over $100 million. The Company was advised in all aspects of value maximization, including the potential sale-leaseback of its real property assets, the potential sale of its food processing facility on a stand alone basis, and the consideration of a sale of the business in its entirety to a variety of strategic and financial buyers. Many of the buyers that were interested in acquiring Furrs, had knowledge of the restaurant industry and family-style dining in particular. Furrs determined that a sale to Cardinal Investments, a Texas based equity sponsor, was in its best interest due to both the value and financial certainty of its offer.